We offer a full range of materials, dimensions and styles for work surfaces and countertops. Our solutions meet needs for science and electronic labs, ESD (static control), cleanrooms, manufacturing, engineering, training/education, offices, mail rooms, warehouse, etc. Note about sizes: There is no minimum size for a work surface, countertop or shelf. Typical width (depth) ranges between 24”-42” and typical lengths range from 3’ – 8’, with tops installed end to end for longer rows. Larger sizes are available. For most materials, width dimensions are available up to 48” without seams and length options can range up to 12’ without seams, for some materials. Also used for its chemical and heat resistance, this resin material is a greener product than epoxy resin. Its performance in most challenging lab environments is fairly comparable to epoxy resin, but users should review respective data sheets as epoxy resin is somewhat more robust in specific conditions. TopLab Plus contains cellulose and is not considered self-extinguishing. Generally considered more visually aesthetic than epoxy resin, it’s available in 12 colors – which do not permeate thru the material, so all edges are black, regardless of top color (12 available). Trespa also makes TopLab Ecofibre, a green certified product designed for wet labs. Specified for its extreme chemical and heat resistance and the standard for many scientific laboratories. Color permeates through entire material. Considered self-extinguishing, epoxy resin is widely used where work tops face challenging use. Various edge options available, including, chamfered, crescent and others. Under edge drip grooves, backsplashes, sinks & other options are available, Typically black, but other colors are available, including gray and blue. Brush finish 304 stainless steel tops are available on 4L style benches. In this design, the material is formed over 1” thick medium density core material which is sealed on the underside. 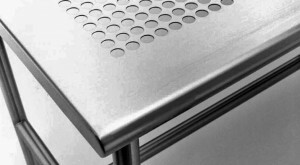 For 100% stainless steel 4 leg style benches, without core material, tops are available in solid, perforated or spaced rod designs. Electropolished finish is an option. Typically specified for schools, industrial use, training facilicites, etc. 1” thick maple butcher block material is available as worksurfaces for all of our bench and workstation designs.